Our climatic test service is used by OEM’s and component suppliers from different industry sectors to test and validate the functional compliance of large and/or heavy electro-mechanical machinery in extreme climatic conditions. Extreme temperature levels, temperature cycles, humidity, and solar infrared heat loads are simulated in the large climate chamber. 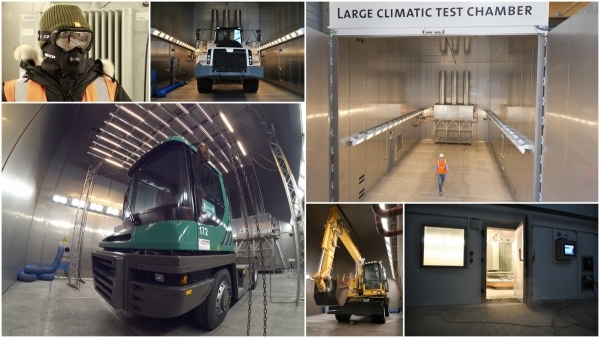 Our large climatic test chamber was designed with a number of unique features in order to facilitate different industries that manufacture large and heavy machinery in their climatic test and validation needs such as the large inner dimensions (10.6m x 7m x 8m test space) and more than 150 ton weight capacity. This specification makes it possible to test heavy machinery or validate multiple prototypes in one test run. The climate chamber is installed on a break-bulk terminal in the port of Antwerp, enabling easy water, train and land logistics and quay handling of the targeted test specimens for our international customers. Test temperatures can range from -60°C to +60°C, making it possible to test every possible ambient temperature on earth in either cold or hot climate markets with high precision ±1K.. The installed cooling power in the laboratory can also compensate 250 kW of heat load at -20°C, 30kW at -60°C and allows us fast cooling of the air temperature in the climate chamber from +60°C to -40°C in one hour. The large installed cooling power specifications makes the test facility perfect to validate cold start-up behavior of large and heavy machinery, and test products on a system level for cold climate compliance for example. The laboratory is also equipped to carry out air humidity and dry-heat tests in a range of ± 2%RH to ±95%RH. Also a IR solar light array with 10 - 950W/m² operating range for solar infrared heat simulation, thermal cycling programming software, exhaust air systems for vehicle testing, air ventilators, ice-spray guns to simulate icing events, different types of temperature sensors and DAQ systems are available to provide a one-stop-shop climatic tests to our customers. 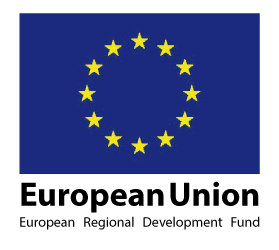 A detailed factsheet of the large climate chamber can be found here. 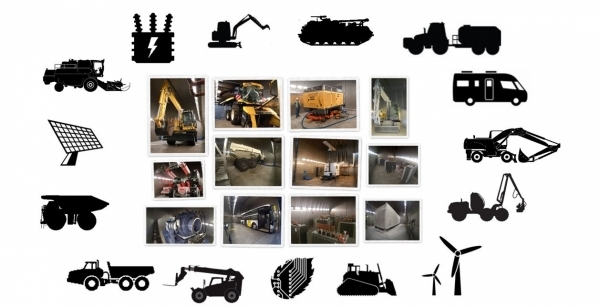 Different machinery like wind turbines components, off-highway vehicles, construction and mining machinery, electrical grid infrastructure, aerospace components and military equipment are often required to survive and operate under extreme temperatures and climatic conditions ranging from artic cold, to tropical heat and/or dry heat desert conditions. We offer unique test infrastructure to test such machinery for every possible climatic condition on earth in order to ensure reliable and save operations in such harsh environments. Find out more information about the climate chamber tests that we offer for different industrial markets and industrial machinery. The climatic test lab can also be used for shared R&D and academic research projects.